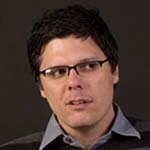 Carl DiSalvo is an assistant professor of Digital Media in the School of Literature, Communication and Culture at the Georgia Institute of Technology. He earned a Ph.D. in Design from Carnegie Mellon University in 2006 and was a postdoctoral fellow at The Center for the Arts in Society and The Studio for Creative Inquiry (also at Carnegie Mellon) from 2006-2007. His research is rooted in the humanities and arts and might best be characterized as a kind of design inquiry. He is particularly interested in understanding and describing the social and political uses of technology in cities. As part of this research, he designs technology platforms and participatory programs that engage and enable urban communities. Much of his current work in this area is funded by the National Science Foundation and Intel Research. DiSalvo is also deeply committed to the development of design theory and criticism. He is currently working on projects that examine information design as a social practice and the role of design in the construction of publics. In addition to academic pursuits, DiSalvo has extensive professional design experience, most notably working at MetaDesign (2000-2001) and as a consultant to the Walker Arts Center’s New Media Initiative (1997-2000). In 2006 he co-founded DeepLocal, a design and software company specializing in interactive mapping and location-based services.